If you often feel sleepy during the day no matter how well you slept the night before, and your bed partner or family members complain about your snoring, you may have sleep apnea. Sleep apnea affects approximately 3 to 5 percent of the population. It’s also more common in women in menopause, affecting roughly 30 percent of women at that stage of life because of hormonal changes. There’s more than one kind of sleep apnea too. With central sleep apnea (CSA), you stop breathing during sleep for seconds at a time, for reasons unknown, because your brain stops telling your muscles to breathe. With obstructive sleep apnea (OSA), which Lehigh Valley Hospital (LVH)–Pocono. “When your oxygen level goes down, your body senses it and tries to wake you up.” Each glitch jolts you into a lighter stage of sleep. Cardiac concerns In addition to leaving you frequently feeling tired, edgy and lethargic, untreated sleep apnea can lead to memory issues, high blood pressure, high cholesterol, type 2 diabetes, heart problems and stroke. The results of a recent 10-year study suggest that people with moderate to severe untreated sleep apnea have a risk of stroke 2.5 times greater than that of the general population. affects 85 percent of those with sleep apnea, tissue in your throat temporarily closes off your airway. You gasp and wake up as many as 130 times in a single hour, but usually not long enough for you to realize it. You might also have a mix of both kinds of sleep apnea. “Sleep apnea is stressful for your body. It’s like someone putting a pillow on your face while you’re sleeping,” says Samer Alkhuja, MD, a fellowship-trained and board-certified pulmonary and sleep medicine physician with Lehigh Valley Hospital (LVH)–Pocono. “When your oxygen level goes down, your body senses it and tries to wake you up.” Each glitch jolts you into a lighter stage of sleep. In addition to leaving you frequently feeling tired, edgy and lethargic, untreated sleep apnea can lead to memory issues, high blood pressure, high cholesterol, type 2 diabetes, heart problems and stroke. The results of a recent 10-year study suggest that people with moderate to severe untreated sleep apnea have a risk of stroke 2.5 times greater than that of the general population. These ties to cardiac health issues have made doctors much more aggressive about diagnosing and treating sleep apnea early. The good news? Sleep apnea is treatable. If you think you may be experiencing sleep apnea, make an appointment with your primary care provider and bring along your bed partner too. If your doctor suspects sleep apnea, you’ll undergo a screening test called polysomnography, during which electrodes are attached to your skin with sticky pads in several places so monitors can record your heart rate and breathing as you snooze. LVH–Pocono offers home sleep studies so you can do your sleep study in the comfort of your own bed, with sensors collecting information that can be downloaded at the lab. If you’re diagnosed with sleep apnea, your provider will recommend treatment based on the severity of the condition. “The best treatment is a CPAP (continuous positive airway pressure) machine,” Alkhuja says. A CPAP machine is worn while you sleep, and uses air pressure to keep the airway open. For people who can’t tolerate a CPAP machine, physicians at LVH–Pocono can offer an oral device that pulls the bottom jaw forward just one-fifth of an inch, which is enough to keep the airway open during sleep. “The oral device fits in your mouth like a denture and must be custom made by a dentist,” Alkhuja says. “It’s very effective in most people.” The cost is around $2,000 (not generally covered by insurance carriers). Shedding pounds, if you need to, can also help cure sleep apnea without a CPAP machine. When you’re overweight, fat can surround the muscles of the upper airway, preventing it from staying open while you’re sleeping. “If you lose weight, you could bring your sleep apnea from severe to mild,” Alkhuja says. “[And] if you have mild or moderate sleep apnea, losing weight could cure it completely,” Alkhuja says. 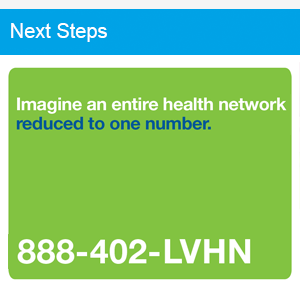 To make an appointment, call 888-402-LVHN (5846).